Today Dorothy Wilson shared her incredible marriage testimony with Dr. Deb Wiley and Kisha Gallagher on Hebrew Nation Radio’s morning show Renewed. We never know just what YHWH has in store for our future. Sometimes it’s the last thing we expect. We have all been hurt and rejected. We have all made mistakes and suffered consequences. We all need healing in one form or another, especially emotionally and spiritually. Dorothy’s story chronicles her journey from brokenness to new life. We were inspired by the unique way that Abba brought her emotional healing and how that led to a glorious Sukkot wedding. May Dorothy and Tommy Wilson’s marriage testimony encourage you to follow the still small voice of the Ruach HaKodesh (Holy Spirit), to allow Him to heal all of your broken places, to renew your commitment and covenant with your spouse, to trust Him even when (especially when) things seem to be at the breaking point. You don’t want to miss this program! The podcast is free for one week, listen here. Read more from Dorothy on her blog: Red Shoooz. Well, I just wanted to comment that as I was listening to Dorothy share her testimony of our story, I had tears in my eyes as I relived the experiences we had. During that time the phrase that popped vividly in my mind of our entire experience was, “He thought about us in detail”. What a truly amazing Father we have who’s thoughts are toward us and who cares for us deeply. Interesting, and a blessing to hear Dorthy’s testimony. I just… it’s just that I’m in this place where I feel like I’m stuck between two different realities – On one hand, Yah gave me a confirmation about 5 years ago about something specific, but on the other hand, I have yet to see anything actually happen, and what I do see in front of me, my circumstances, seem to directly conflict with what Yah confirmed. Scripture teaches to seek wise counsel, and I did. I wanted to make sure I wasn’t crazy, that I wasn’t just hearing something that I wanted to hear. Like Dorthy, I wanted accountability, wisdom, spiritual insight from the Rauch that maybe I missed something. Maybe I misunderstood something. Maybe this is all in my head. From seeking counsel, reading scripture, and much prayer, it seems like I have no reason to doubt what Yah told me 5 years ago – yet, there are the circumstances in my life that seem to directly contradict what He told me. I know, I know I need to trust Yah. I remember Isaiah 55:8-9. I feel like I understand why Abraham and Sarah stepped out on their own to do something they weren’t supposed to do, letting Abraham lay with a maidservant to provide a male heir, trying to fulfill YHVH’s promise on their own because they didn’t trust what Yah told them. I understand why. Do I condone it? No, but I understand. They, too felt like they were trapped between two different realities: Knowing what Elohim told them Yet at the same time, their circumstances conflicted with what He told them. It can get frustrating and stressful. But I know this: I HAVE to trust my Father. Because if I don’t, it WILL drive me crazy. I know this because it already has in the past. And the ONLY thing that gives me peace is surrendering it to the Father each and every time I give into the illusion that I have any kind of control over the situation when I know I don’t, and remembering to trust Him all over again. Anyway, the situation I’m talking about in my life, distance is a factor. So, thank you for basically saying that distance ain’t no thang when it comes to the Rauch. He can do what He wants, when He wants, how He wants. Thank you for that confirmation and reminder. It is also frustrating because the other party involved doesn’t believe that the Rauch speaks to us about things like this, or that He speaks to us in this way. There is a lot more I could say about that, but I don’t want to say too much, so I digress. I feel like this whole situation is just one big mess, and the more focused I get on it, the more stressed I get because I just don’t see how it’s actually going to happen in real life, based on what I see in front of me. It just doesn’t make sense. And this is where I remind myself that I need to stand on His Word. Yeshua teaches that we need to stand on His Word like a Rock, and it is His Word that will keep us standing. If we try to stand on anything else, we will crash and fall (Matthew 7). I know I need to trust Him. I know nothing is impossible with Him. I just need to keep trusting, keep having faith. It gets hard sometimes, but, I know that the only thing that gives me peace is trusting my Father, and things happen in His timing in His way, and it’s His way that’s best. I had typed a lengthy reply to your comment on Sunday. Now, I’m sitting on a plane waiting for our gate to come available and replied to a recent comment —– and noticed that my reply to you is missing. 😐 I’m currently out of town for the Revive conference, so I don’t want you to think I didn’t care about your comment or merit it a response. I do care! Thank you for the consideration to let me know that you had left a comment but possibly due to technical difficulties, it didn’t make it through. I appreciate your prayers and your thoughtfulness to let me know the situation. I look forward to reading your reply when you get a chance to send it. Thank you for listening to the Renewed radio program and commenting regarding my testimony. I completely understand what it must feel like to “be stuck between two different realities”. There were a few details I did not share that I would like to now with the hope that you might be encouraged. In 1998 I was challenged by a very good friend to write down the character qualities I would like to have in a future mate. I had been divorced in 1991 and was completely convinced I would never marry again, but I went along with her challenge anyway. I wrote that I wanted someone who loved God with all of their heart and would put Him first. My daughter was 11 at the time so it was important that this man would accept my daughter and she would accept him as a step-father. There was one detail that I left out of the list, but pondered it in my heart. It was something between me and YHVH and I knew if the “right” man every came along, he would fulfill this as well as the character qualities I listed. She DID NOT like him at all. I should have taken that “red flag” as a sign, but ignored what my gut was telling me because he fit all the other qualities. In spite of her feelings, our relationship progressed because I thought she would eventually come to like him. As we discussed our future together, he suggested once we were married that I leave my then 14 year old daughter with her father so I could travel with him. He felt I was “too attached” to her and I needed to let her go! Oh, and that one thing I didn’t write down but pondered in my heart…was that my future husband could dance! This man had absolutely no rhythm (although he tried) and I overlooked that as well! The relationship soon ended and I was devastated for many reasons. I thought I clearly heard from YHVH that it was ok for me to pursue marriage with this man, but ignored the “red flags” as the relationship progressed. He is an amazing person who remained a friend. He just wasn’t meant to be my husband. Trusting and waiting on YHVH is the key. When we try to orchestrate anything in our lives, like Abraham and Sarah, we get an Ishmael instead of Isaac! YHVH desires to give us HIS best, and sometimes that means letting go of what WE thought was best and waiting for HIS! The man who was pursuing marriage with me is a wonderful man with amazing Yeshua-like character qualities, he just wasn’t YHVH’s best for me. The man YHVH had for me was being prepared 3000 miles away. Neither he nor I were ready to enter into a marriage relationship because we both had baggage that needed to be removed and our hearts needed healing. Through many lonely days & nights I allowed YHVH to search my heart and begin the healing process that prepared me to become a wife. 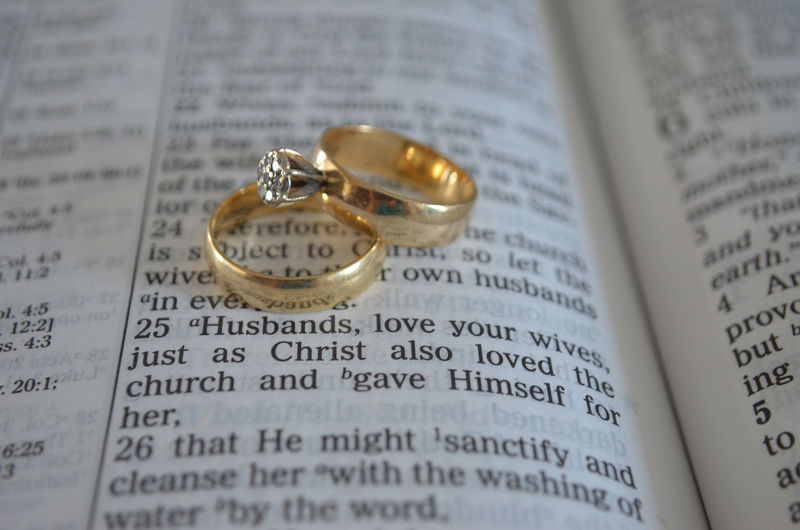 I was not ready to be a wife in the previous relationship, and YHVH knew it. My heart goes out to you Valerie because “waiting on YHVH” is not always easy. As you continue to seek YHVH and wise counsel regarding the confirmation you received, don’t allow your focus to be on the unanswered prayer. Ask YHVH to teach you how to be a wife to your future husband. Allow Him to work on every area of your heart that needs healing. P.S. My husband Tommy posted a comment and stated, “He thought about us in detail”. This statement is true in every way…also because he can dance!!! Thank you for replying. I know all too well, the frustration of getting my hopes up only to be disappointed over and over again. The type of situation you mentioned with that guy you dated before you met your husband, thinking he was ‘the one’. I had a similar experience with three different guys in the past. I didn’t date any of them. But, they were guys I knew in the past that I was interested in. The last guy of the three, I so wanted him to be the one that I struggled with feelings for him for 4 years. The whole time, the Rauch was telling me in my spirit, in my heart, that he was not the one. But I didn’t want to listen. So, I struggled. I wasn’t able to move on from that until I was finally willing to accept that it was not Yah’s will. The current situation I’m talking about now is markedly different than those first three situations. This is a situation where, for 8 years Yah was telling me, he was ‘the one’. But because of my stubbornness and pride, I refused to listen. That’s just the gist of it. This is not a situation where I actually wanted to be with this person. At least not at first. I had a lot of issues at the time which were keeping me from accepting what Yah had told me. Not just general immaturity, but also issues with emotional intimacy. I had been verbally abused growing up at home, and I needed to heal from the issues that came from that upbringing. It was because I did not want him to begin with and because of how stubborn I was, that I had already tried in every way possible to explain this away. I used every reason, every excuse, anything and everything to explain away what Yah told me so that it would not be true, but nothing worked – they all had about as much weight and strength as weak paper cups. There were just a lot of issues I was dealing with at the time. When I finally accepted what Yah had told me, over time, Yah healed my heart and allowed me to see this guy in a different light. And knowing how stubborn and prideful I was at the time, that is a miracle. And that is not an exaggeration. Now, I apologize for the strong tone here, lol. I feel like from reading what I wrote that maybe I’m getting defensive, and that is not my intention. If I sound defensive, I don’t mean to. I just mean to be clear and understood. Or, at least I hope. Anyway, aside from all that mentioned above, I have considered the possibility that maybe, this time of waiting is actually meant to teach me patience, to teach me what it is to really trust Yah, especially when I don’t see the physical proof of in front of me. I think of in Isaiah 40, where it says that those who wait on the Lord will renew their strength. And I think of when Yeshua told Simon to lower the nets in the water to catch fish, and Simon said, “Master, we have toiled all night and caught nothing; nevertheless at Your word I will let down the net” (Luke 5:5). And I wonder if I would be willing to exercise as much faith in spite of my doubt. Because so far, it feels like I’m failing at every corner. But, like I said, maybe this time of waiting is meant to test my faith in Yah. Maybe this time of waiting is meant to renew my strength, help me grow stronger in my faith in Yah. Maybe that in itself is meant to prepare me for what’s ahead. It’s possible, anyway. In the meantime, it gets hard. And, like I said, that is when I have to remember to trust Yah and surrender to Him all over again. Do you mind emailing me a quick “hi” at gracentorah@gmail.com or renewedhnr@gmail.com? That way, I can at least give you my comments. Every time I respond to you in the comments, things seem normal, but it’s not posting!?! Maybe it’s a length issue, as the short ones are working. I’m perplexed. There is no sound except commercials n music.